Making Gains, Setting Goals, and Getting the Coaching YOU Need to Succeed! If the Open is the culmination of all the hard work you have put in since you started doing CrossFit, what happens now that it is over? To begin, as Coaches, we couldn’t be prouder of all the hard work and energy every one of our athletes put into the 2019 CrossFit Games Open! Just participating in the 5-week competition says a lot about you as an athlete and how seriously you take your training. The fact is that most people who work out never truly test themselves to see how they have progressed in their fitness. Sure, they probably look and feel better than when they started, but how could they possibly know if they are getting the most out of their training without a progress check? One of the many incredible things about CrossFit is providing a way to measure our progress and being able to see how far we have come since we started. The Open is just one of the many ways we measure progress. 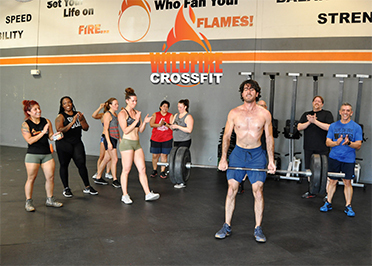 Another method is the CrossFit Total like we did last week, which is, the combined weight of your 1 Rep Max Back Squat, Shoulder Press, and Deadlift. Benchmark workouts like the CrossFit Girls and other named workouts like the “Filthy Fifty” we did this week, and even specific exercises like max effort pull ups, pushups, or double unders are other ways we can measure progress. As an athlete, it’s important to understand your progress and measure your results. Check out the graph below. 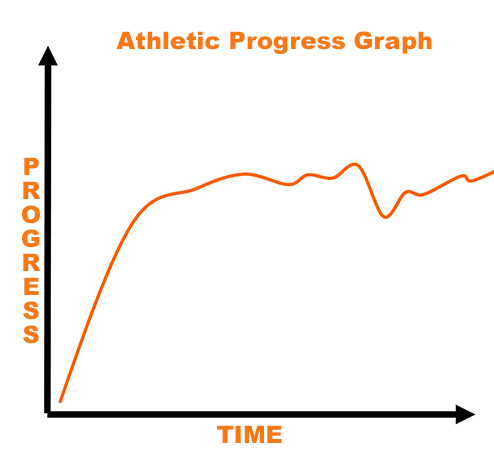 The horizontal line measures the time an athlete has been working out and the vertical line measures their progress. Notice that the biggest spike is going to come in the beginning, especially if you are new to fitness or if it’s been a while since you worked out. This is the time when you are learning the exercises, rep schemes, and skills that are required. This beginning period is a great time. Enjoy it, and remember, it’s not that the workouts get easier, it’s that you are able to push yourself harder. During this time, you may get your first pull up or double under, do your first squat clean without having to be reminded of what a squat clean is, and learn what a 1 rep max really feels like without just deciding the last weight you did was “heavy enough” because it was a PR (Personal Record). It may even seem like you are ringing the PR bell every other day as you learn new skills and lift more weight and you deserve every ring because you are already doing something most will never do and that’s learn new skills, challenge yourself, and actually doing something about being the best you can be! Just because the biggest gains are in the beginning does not mean you are going to stop progressing. Once you reach a certain level, the PRs just aren’t going to happen quite as often. Just being honest. It doesn’t mean they aren’t going to happen, it’s that you have to challenge yourself just to add 5 or 10 pounds to a lift or shaving a significant amount of time off a workout you have done 5 or 6 times or more. Instead of just learning how to do a kipping pull up, now you are working on stringing them together and going faster with more complex skills like butterfly pull ups and making your bar and ring muscle ups more efficient. Then, there’s the dip in the graph. It could be that you had an injury, had to take time off training, OR, the kiss of death to many CrossFit athletes, fell in love with someone who doesn’t do CrossFit. Just kidding….we love, LOVE. 😉 Just stay consistent, you want to keep your energy up for that new relationship. 😊 It may even be that your goals have changed. The point is that things come up and as an athlete, you either show the mental strength and fortitude to persevere and push through, or you quit and wake up in 10 years crying “shoulda, coulda and woulda”. What’s the point? What was my point…oh yeah, PROGRESS. Making Gains. Getting Better. Being your best self. 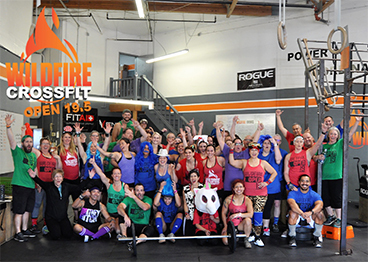 We talk a lot about fun at WildFire and yes, we want you to have fun in your training and there’s going to be lots of time for that. As coaches, we are here to help you get better. Keep in mind, progress is going to be different for everyone. For some, it could be to get those first kipping pull ups, string together your bar muscle ups, or get a CrossFit Total you are proud of. For others, it may be to be able to squat below parallel, be able to run 400-meters without walking, or do box jump to an 8” box instead of a step up. Progress is going to be relative to the athlete who is making it happen and all goals are important. Last weekend, I was talking with an athlete who was very excited about all her PRs last week. She was thrilled (and we are thrilled for her) that she got her handstand push ups and kipping pull ups. As coaches, that’s what we love to hear. As human beings, we have what it takes to evolve, to push ourselves to get better, and to make progress no matter what stage of our fitness journey we are in. It also doesn’t take a lot of extra time, in addition to what you are doing in class, to speed up that progress and make bigger strides in your fitness. Just an additional 5-10 minute 2-3 times a week can do wonders as long as you are focused on what you are doing and have a specific game plan set up. Now, before I continue, I want to be clear. Just coming to class consistently and working hard when you are in class, you are going to make incredible progress, and we are extremely proud of you for taking the time and being a part of the WildFire Community, and we know how valuable your time is. Since the Open, Tiff and I have had several people ask about learning new skills and just all around making bigger gains in specific areas. We, as coaches, are here to help you make it happen, and more important, we WANT to help you make it happen. The first thing is to continue taking class. There is no substitute for what we do in class and it should be considered your base. You are going to push yourself harder and challenge yourself more when you have other people around. Plus, this is going to help you continue working on all areas of fitness while you are focusing on something more specific. Next, set up a specific game plan. Take kipping pull ups. You could just mess around on the bar a few times a week and eventually, they will get better, OR, you can make a plan of action, follow it through, and reach your goal faster and more efficiently. We’ve all seen athletes like Ron, Chelsea, Z, Thomas, or Stephen who either come in before or after class to do some additional work. They aren’t just coming up with something randomly on the fly, they are executing a program they are incorporating in addition to their base of class. As Coaches, we are here to help you work on skills, get faster and stronger, and ultimately reach your goals. 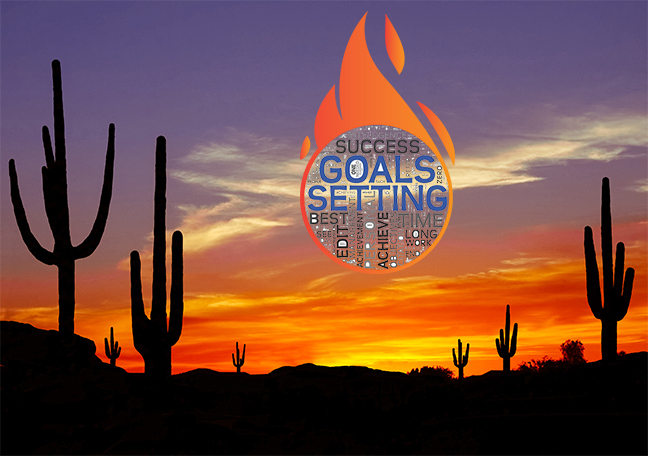 We are happy to sit down, learn what your goals are, and help you develop a plan that you can execute. Decide how much time you have to commit to doing extra work and be realistic. It’s better to be consistent and do a little more if you have time than consistently not get everything in. Write it down, don’t just keep it in your head, tell someone, a coach, a fellow athlete, someone who will help to hold you accountable. Next, decide exactly what you want to work on, why you want to work on it, and what it will mean for you as an athlete to accomplish your goal. From improving your gymnastics skills to building strength or endurance, the list is endless. By enlisting the help of one of the incredible coaches at WildFire CrossFit. Someone who you feel comfortable with and see regularly. They will be able to help you more clearly define your goals and set up a game plan that includes programming to get results. Helping you reach your goals is what we are here for and we want to help! Finally, there are 2 options for working with a coach. The first, is having a coach help you set up a game plan that you will mostly execute on your own. This is part of your membership, and completely free. Understand, we are still going to follow up, answer questions along the way, and if that coach is there when you are completing the programming you are executing, of course they are going to give you feedback for improvement and make necessary adjustments. Plus, with your permission, your Coach will also inform all of us, via our Coaches Facebook page, what you are working on so we can also help when we have you in class. The second option is to add some personal or small group training sessions where a coach will set up a game plan AND meet with you on a regular basis to help you execute that game plan. They can adjust as you go, help to hold you accountable, and make sure you are doing what it takes to reach your goals. If adding some personal training is something you are interested in, send us a message and we will get you the options. It doesn’t mean you can’t still do things on your own, it just gives you the undivided attention of an expert to make sure you are doing everything you need to succeed. We have a variety of options. If you know other people who have similar goals, we can even do small group training. One of the many things that makes me SO proud of this community is how hard you guys work, encourage each other, and cheer each other on to be your best. Okay, that’s 3 things. While I know all the benefits of working with a coach to reach your goals, you can also grab a fellow athlete who you know wants to get better at something similar and hold each other accountable to spending a few minutes of focused effort after class a few times a week. I have seen athletes work on gymnastics skills, strength, and endurance in the past, and just having someone else there to keep you on point will help. I remember watching Lora & Nikki of the 5:15am crew work on pull ups a few times a week for a couple months. Both did kipping pull ups in the Open this year. So, don’t wait for the next competition or CrossFit Open to hope that the skills magically come to you. Get started TODAY! Our Coaches are here to help, and you have an entire community behind you! So, let’s make it happen, and 3-2-1-GO! !